White-collar cases necessitate a lawyer experienced in defending complicated fraud cases. Whereas almost any criminal lawyer has experience on a DWI or a domestic violence case, relatively few criminal defense lawyers have experience with the complicated legal and factual issues that commonly arise in white-collar criminal defense cases. There is a common misconception in white-collar cases that defendants rarely are sentenced to imprisonment, or if they are, serve short sentences. Martha Stewart was investigated for insider trading, but ultimately only found guilty of lying to an FBI agent during an interview. With all of her resources she still ended up serving a prison sentence. It is, in fact, unusual for a white-collar defendant in Texas or federal court not to receive a sentence of imprisonment. Before hiring a white-collar attorney, follow our detailed guidelines on selecting a lawyer, and ask a firm for cases they have defended and won for clients similar to your own. At Broden & Mickelsen, we publish our cases and tell clients whether we are the best attorney for their defense. Whether a “white-collar” crime is charged in federal or state court is largely determined by the agency investigating the case. Clint Broden & Mick Mickelsen are white-collar attorneys with experience defending clients charged with white-collar crimes in both Texas and federal courts. Federal law enforcement agencies that traditionally investigate fraud related crimes, such as the FBI, the Secret Service, the Postal Inspectors, etc., tend to bring their cases to federal prosecutors. State law enforcement agencies, such as local police departments will bring their cases related to white-collar and fraud to the district attorney’s office for prosecution. Generally speaking, federal agencies expend more resources to investigate and prosecute a fraud case than state agencies. Federal cases will often allege a complex pattern of fraudulent activity or corruption while state fraud prosecutions tend to focus on easily provable allegations, such as a defendant routinely accepting checks for services never rendered. If you are in need of a white-collar attorney anywhere in Texas, contact Broden & Mickelsen. 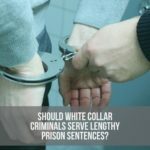 Dallas White Crime Lawyers Explains White Collar Crime: Should Criminals Do the Time?